Have you ever had an eager to escape from something? Especially from routine, even though that routine is something you love to do? I’ve been in that condition so many times (guess I don’t love my job that much? Kekekekeke). A week ago, after spending 3 fierce days for asking a day off from my boss without informing my real reason for taking it (naughty employee), I made another escape and I called it a sweet escape and the place was Banjarmasin, South Borneo. I called it sweet escape because since 7 months ago, from the very first time I put my little step on South Borneo, where I work right now, Banjarmasin and surrounding area already on my travel wish list. Banjarmasin and surrounding area have so many astonish things to offer such as floating market, Martapura (Diamond Town), Meratus Complex, river adventure, beaches, handicraft and art, culture, culinary, historical places, and many more. So, why couldn’t it become on my list? Our first escape was Floating Market in Lok Baintan. 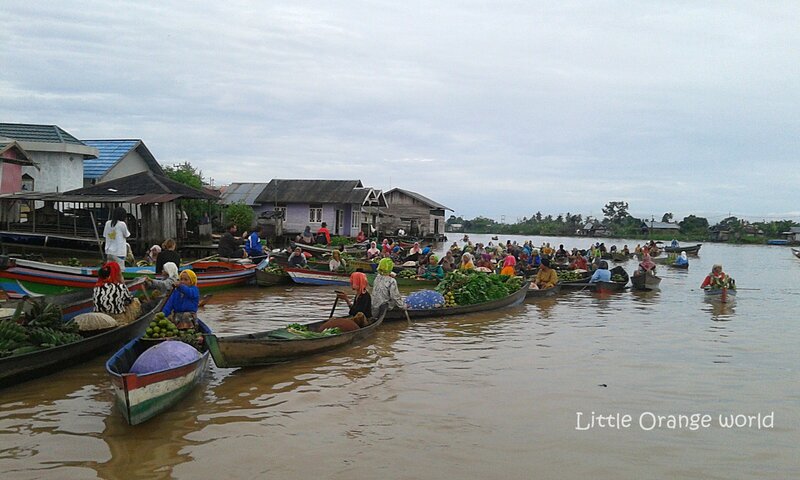 Floating market is Banjarmasin’s main tourist attraction. There are two floating market; at Kuin and Lok Baintan. Lok Baintan was the one we were visited. To catch up with unique trading culture of Banjar tribe, we had to wake really early at morning, I think, even the sun hadn’t prepared to rise that time. LOL. Taking one hour trip via river, we reached Lok Baintan Port, centre of floating market. Buying some delicacies of Banjarmasin, took as many moment as we could, enjoyed the activity of the market while sipping our instant coffee, until its slowly disappearing when the sun slowly appearing and brightened the day. 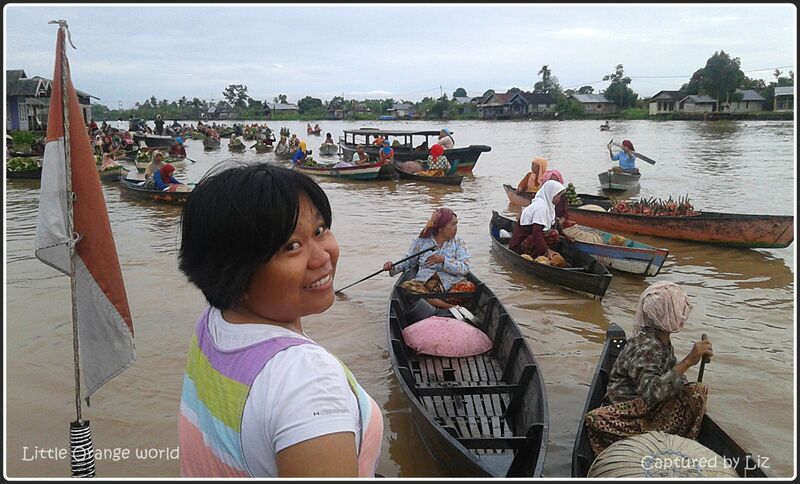 Got enough with floating market, Liz and I continued our trip to Martapura, the Town of Diamond, about 40 km eastward. Kampung Pumpung (Pumpung Village, where people mine diamond manually) and the craft market were set on our next GPS map destination. Guided by limited GPS, we found where exactly “Cahaya Bumi Selamat Souvenir and Craft Market” in one hour later. 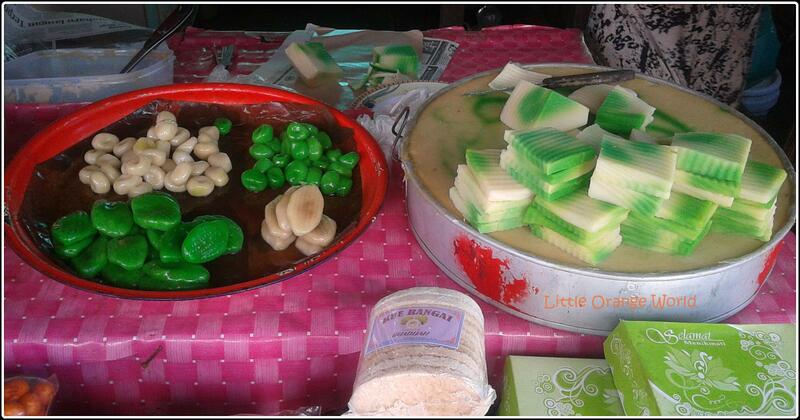 Unfortunately, we had to remove Pumpung Village due to our limited time. So, in order to optimize our trip, Liz and I were leisurely strolling around the market, hunting souvenir, and trying others domestic culinary. 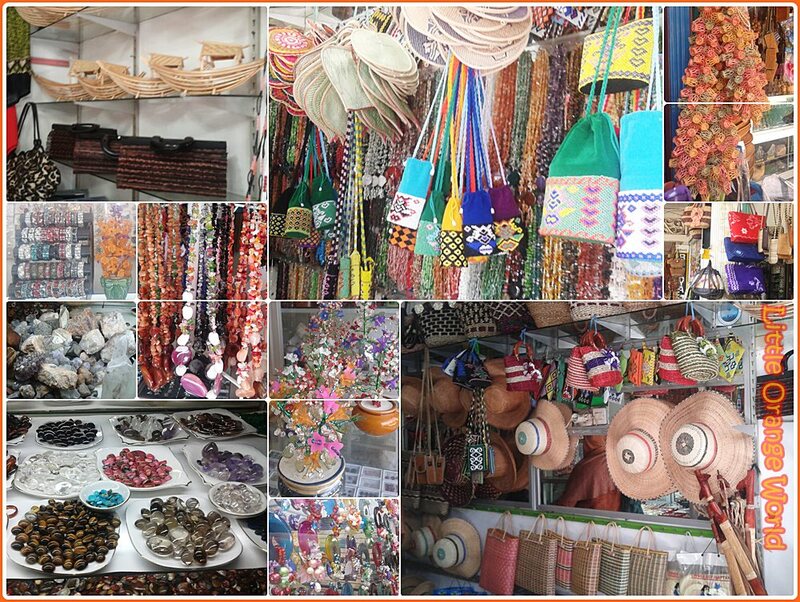 Even though Martapura main offering is diamond in varied carat and prices, there were so many things to bring back home in this market like handicraft from rottan, dried wood skin, rocks, and fabric. Besides diamond, the other handicraft prices in this market are cheaper than in the other places. Finished with shopping, we bought some snacks specialty of South Borneo (I didn’t take the picture all of snack that I bought). 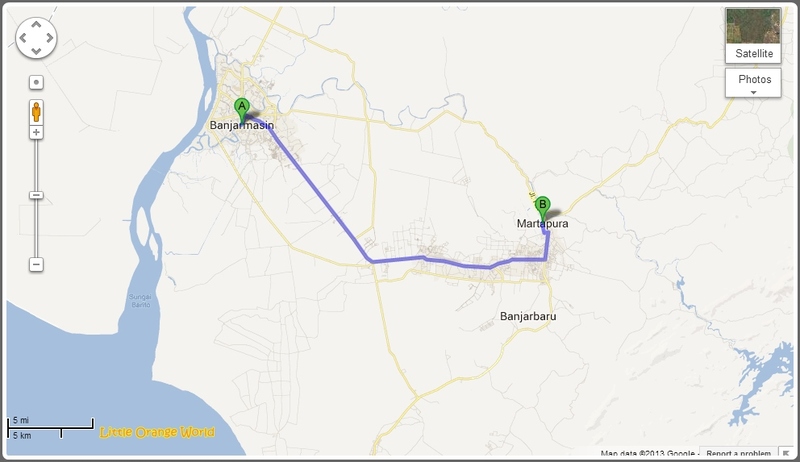 Headed back to Banjarmasin city was our plan for last escape destination. 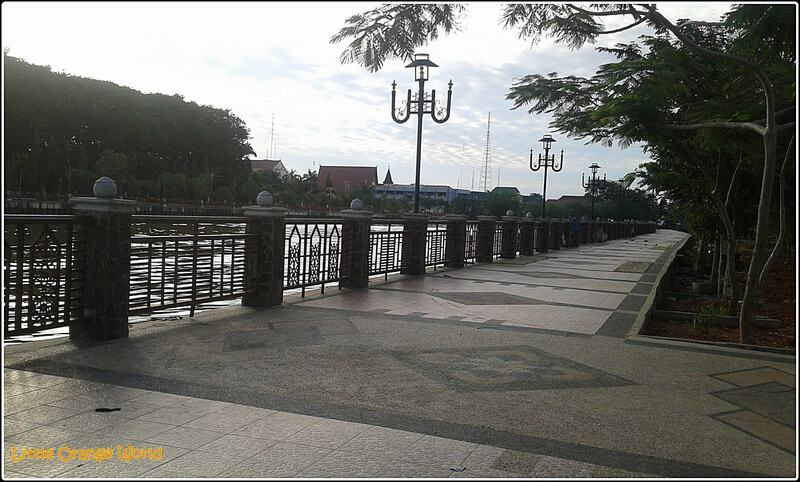 Actually there is much too see there, but once again, our limited time became our barrier for seeing all of the places and experiences that Banjarmasin could offer to us. 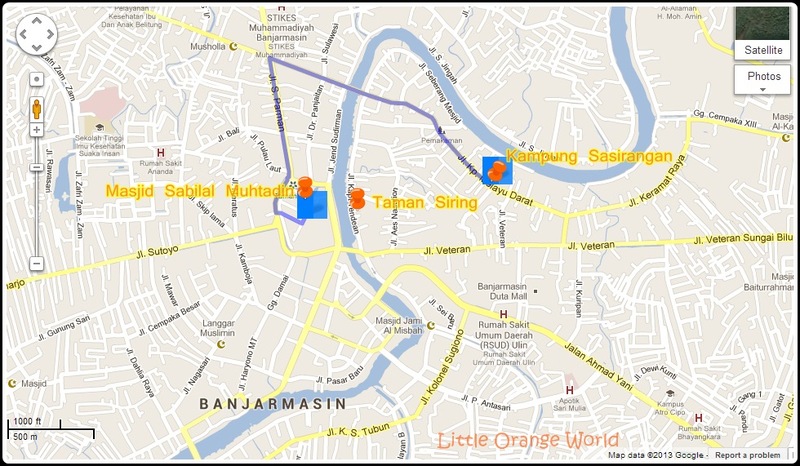 Kampung Sasirangan, Masjid Sabilal Muhtadin, and Taman Siring were chosen because it closes one to another. 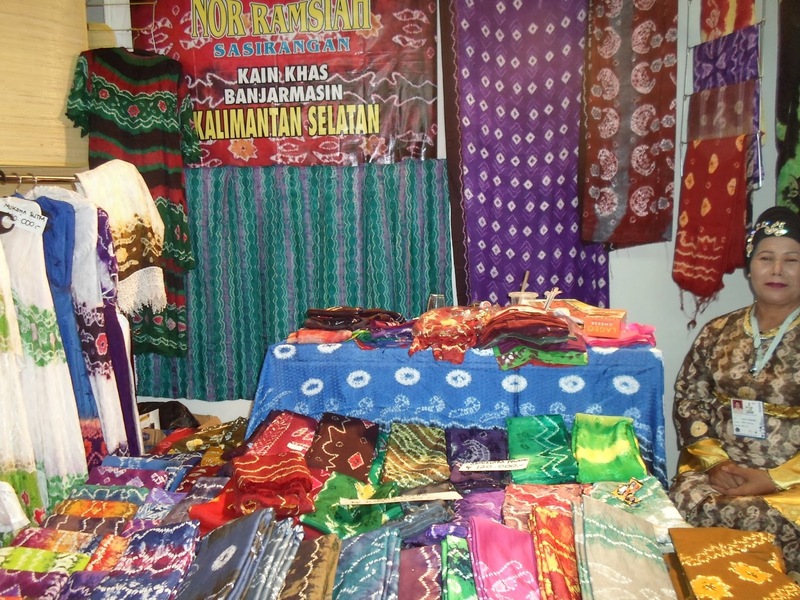 Kampung Sasirangan is a place which produces “Kain Sasirangan” traditionally. It is produced by dipping tied fabric in a colored liquid where the colored liquid is extracted from natural coloring material. And the pattern which is resulted by this process differ depends on how it’s tied, the material of tie, material of fabric, and material of colored liquid. 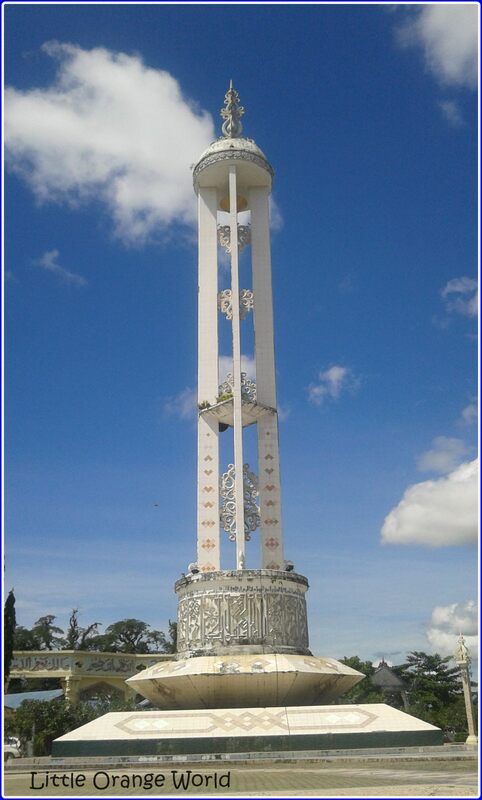 Masjid Sabilal Muhtadin is the largest and mosque in Banjarmasin. 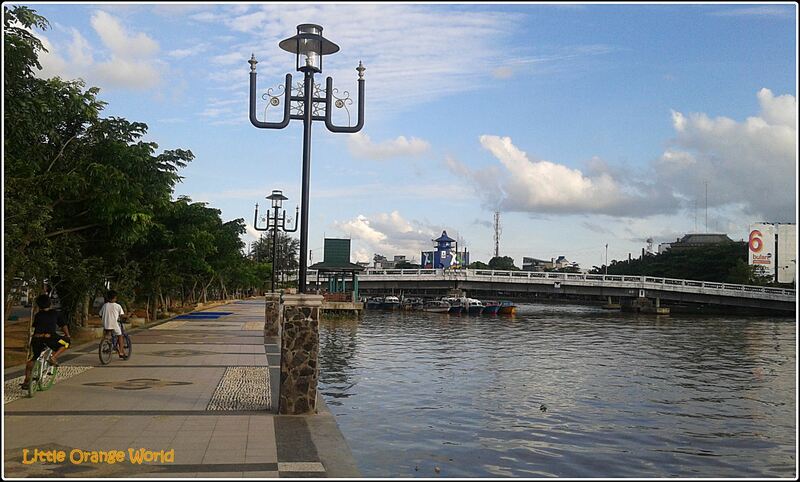 Taman Siring, river side area, a rest area, place for refreshing. At night we could find many street food stalls. We could enjoy any kind of food with river view. Those were my escape routes. Do you want to escape with me? LOL. Be my guess. if they were, just take it as my bad luck. LOL. You’re always welcome, my dear friend! Hi friend, it’s been a while since you’ve last posted, hope everything is fine over there! Thank you for asking it, i yess, i just back from my 2 weeks field break. since that’s the only time for me meeting my family and friend, i don’t do the other things. hehehehe. Great to know you are finally back, my friend!!! Can’t wait to read more posts from you soon…hehehe…. Come to Indonesia :D, i just read besides South Borneo, Central Borneo has floating market too, with different sense. Na, pajang photo2 kerajinannya satu2 dong, pengen liat detail, atau pajang dipinterest jadi gw bs repin. I do enjoy reading of your adventures, Yuna. And I do love markets! AAwwww, nice to hear that you love my adventures because i love it too :D.
so, more adventures stories to come. Really? How wonderful! That is kind of you. Markets are fascinating places, and I always look for special things. So, i’m burning now (Sangat bersemangat) in writing it. Ooh, terima kasih for another word. Please help me with bersemangat – I have it written down, but I have the meaning wrong, I think. Would that be like very eager, or very pleased? ber- is a preposition, when we use ber+noun, it means the word contain the noun. ah, i hope i explain it well. Of course! “Semangat!” is in there. So bersemangat means you’re telling me you are feeling that sense of cheer – happiness. You are owning that emotion, it’s yours. Like that? no..the basic word is tulis=write, pe+tulis–> penulis (writer). Pe+verb (in Bahasa) is equal verv+er (in English). penulis – writer – so the “t” becomes an “n” as well. you even got it? there are some letters that turn in to “n” when we add “pe-“. Off topic, Yuna. I see you are reading a terrible book (my opinion – Nineteen Eight-Four is miserable and hard to read). you are absolutely right, honestly i had tried to read it before, until page 45, but i didn’t go anywhere while reading it. so i stopped reading, changed it in to 3 new books, and now i am trying to re-read it, even thought my reading speed is getting slowly, -_-“!. i think i won’t put it aside since i have started it, I’ll finished it as soon as possible. Iya, Saya tahu. Is it always “t” to “n”? Other letters, too would be baik to tahu. Ah – with “pelajaran” = would that be “learning” and/or “learner” then? Pe-lajaran? If so “learn” would be lajaran, but possibly with a different first letter – maybe “n”? Najaran? (I’m guessing again. LOL). As for 1984, Iya, if you’re going to read, get it out of the way, then you’ll never have to look at it again. Of course, you don’t have to finish a book you don’t like – you could be wild and daring and throw it away. But only you can decide. ehm, sorry, that isn’t the way it has to be. Amazing Allyson, you really amazing, you can learn it just by read. owww, cool. Ah – okay. It’s good [baik] that “t” always turns into an “n” (easy to remember). Terima kasih or correcting me – I must not get ahead of myself (I got excited when I saw the “pe” in “pelajaran”. Next Next post: Give Thanks and That’s All!